This is a very nice double sink. The large sink is big enough to hold your largest stock pot. The undercoating and soundproofing material on the underside is nicely crafted. It looks way more expensive than what you will pay for it. The sink will last you a very long time. This user was entered into a sweepstakes after submitting their honest review. 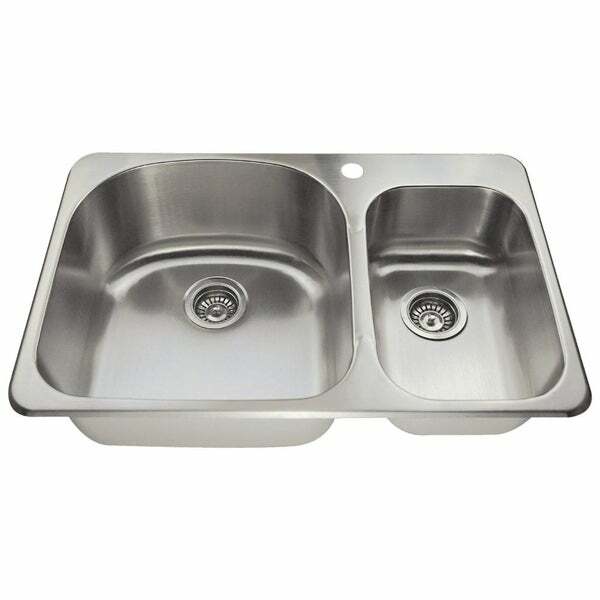 The MR Direct T3121L Topmount Offset Stainless Steel Kitchen Sink is constructed from 304 grade stainless steel and is available in 18 gauge thickness. The surface has a brushed satin finish to help mask small scratches that occur over time and keep your sink looking beautiful for years. A 33-inch minimum cabinet size is required. This sink contains a 3.5-inch offset drain, is fully insulated and comes with sound dampening pads. We ordered this sink for a small kitchen we built in our garage. It is wonderful. This is the second sink that has two sizes of sinks to work with. It makes it handy when working with larger pots etc. The sink seems of good quality and works perfectly for our application. This is a very nice double sink. The large sink is big enough to hold your largest stock pot. The undercoating and soundproofing material on the underside is nicely crafted. It looks way more expensive than what you will pay for it. The sink will last you a very long time. This product met our needs best and was the best overall value.